Discover the newest and finest hotel in Southwest Wyoming, the Holiday Inn Express Hotel & Suites. We are located in the beautiful Bear River valley about halfway between Salt Lake City, Utah and Rock Springs, Wyoming. Evanston is just minutes away from many seasonal recreational opportunities. From Cross-Country Skiing and Snowmobiling in the winter to boating, fishing, and hiking in the summer. You'll arrive to a spacious and beautifully decorated lobby complete with a fireplace. While you're here, relax in our indoor heated pool and spa. Wake up to in-room coffee every morning, and enjoy our complimentary hot breakfast, where we serve hot, fresh cinnamon rolls plus a wide variety of other breakfast favorites. Every spacious room is equipped with a refrigerator, and a microwave. We also offer free high-speed Internet in all rooms. Accommodations range from beautiful spacious rooms to affordable suites and luxurious Jacuzzi suites for that special occasion. You can look forward to a wonderful night away from home. 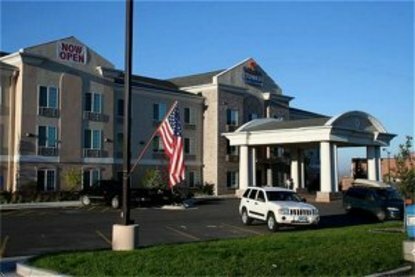 Visit Evanston, WY and Stay Smart at Holiday Inn Express Hotel & Suites. All non-smoking rooms This hotel is committed to providing accessible facilities under the American Disabilities Act. If your accessibility needs are not met, please contact the Hotel Manager on Duty. Should you require additional information regarding accessible facilities for guests with disabilities, please call 1-800-Holiday (U.S. and Canada) or contact the hotel directly. For the hearing impaired, TDD service is available at 1-800-238-5544 within the U.S. and Canada.